The truest flavor in Eastern Oregon!!! Naturally healthy. Your Choice of Flavors. We purchase your quarts of honey and we are always pleased with the quality and flavor, none like it. We like it so much that we have it shipped from your facility instead of buying local honey bee products, except once in a while our neighbor will slip us a small jar from his beehive. 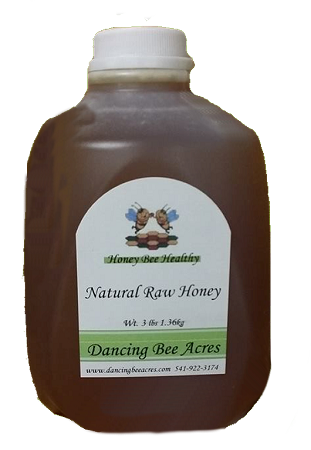 The best honey around and we know how well the bees are taken care of and how healthy the product is for our bodies that's why we get our honey from Dancing Bee Acres, and have been customers for many years. By the way we live in Corvallis OR a 4-5 hour trip to visit you facilities, which we have done several times. Thanks. Also for many years (~20yr) we purchase Royal Jelly caps, and Bee Pollen caps, and AMP all for the treatment of MS and wouldn't go a day without these valuable ingredients in our daily cycle. Thank you! We purchase your quarts of honey and we are always pleased with the quality and flavor, none like it. We like it so much that we have it shipped from your facility instead of buying local honey bee products, except once in a while our neighbor will slip us a small jar from his beehive. The best honey around and we know how well the bees are taken care of and how healthy the product is for our bodies that's why we get our honey from Dancing Bee Acres, and have been customers for many years. By the way we live in Corvallis OR a 4-5 hour trip to visit you facilities, which we have done several times. Thanks.